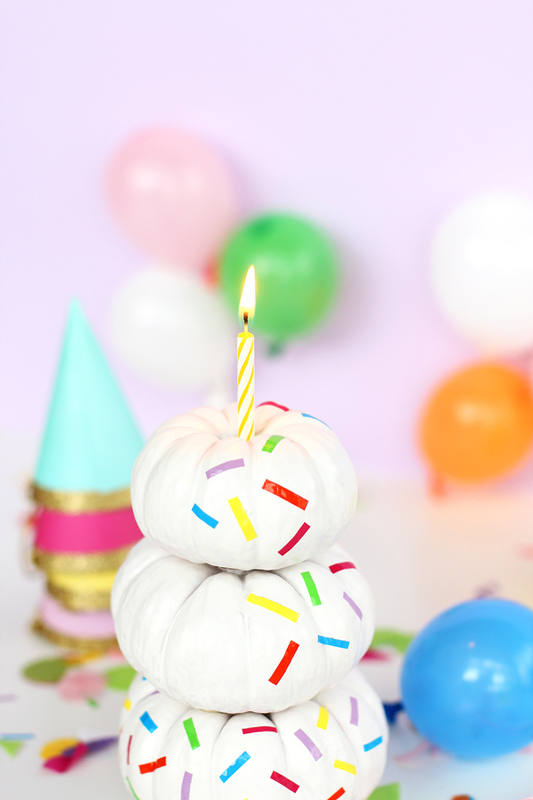 We’ve baked cakes in pumpkins before, but today we are making a birthday cake out of pumpkins. I’m obsessed with this idea! It is such a bright way to decorate the table or front porch for a more fun than spooky display. 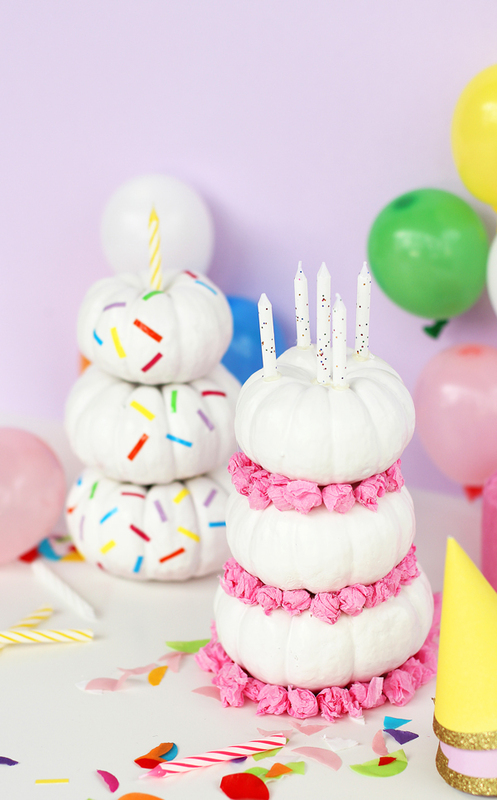 Stacked with sprinkles or layered with crepe paper, these fun pumpkins will give you exactly the bright burst of joy Halloween needs. 1. Spray paint the pumpkins white. I started out with orange pumpkins so it took three coats to cover them completely. You could also get white pumpkins and save this step. 2. Once the pumpkins have dried completely, hot glue each of them stacked on top of one another. Hot glue a yellow candle to the middle of one of the cakes. 3. With your vinyl adhesive, cut out small rectangles for sprinkles. Remove the backing and stick them on the pumpkin with the yellow candle. 4. 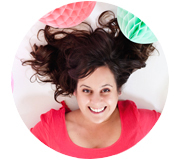 For the pink pumpkin cake – rip up small pieces of pink crepe paper and crumple them into a ball. 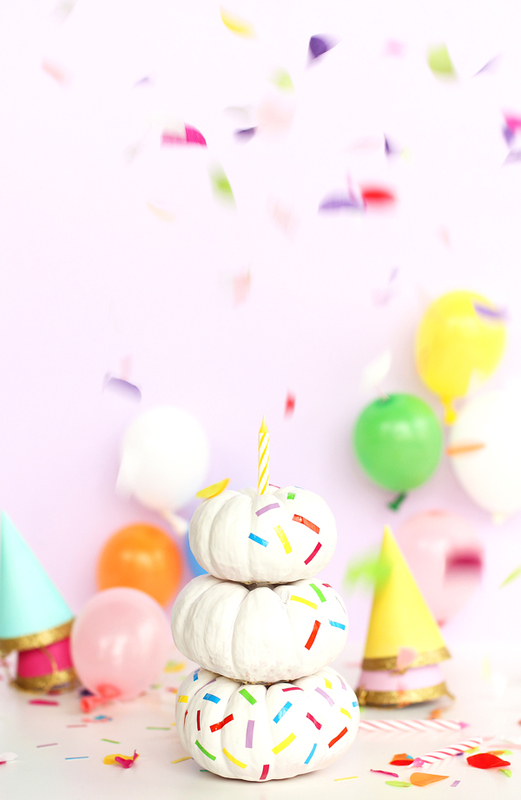 Line them along the bottoms of each of the pumpkins to look like frosting and hot glue into place. 5. Hot glue 5 candles to the top of the pink frosted pumpkin. Serve up this delicious-looking pumpkin decorating idea for every fall party. (Project design, styling and photography @A Subtle Revelry by Sam Ushiro).